Felix H. Wilkinson: Oh, how I loathe adventurous-minded boys. In the opening credits, there appears on the wall a drawing of 'Chad', beside which is written WOT NO PRODUCER ? Operation Seagull and the Blood and Thunder Boys. Forgotten, under seen or not very good? 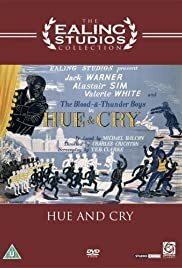 Either way Hue & Cry is a very important film in the pantheon of Ealing Studios. Blending comedy with that of a children's thriller, this would be the launching pad for the long string of Ealing classics that would follow. Nobody at the time would know of its importance, nor did head guru Micahel Balcon have ideas to steer the studio in the direction that it would take, thus practically inventing its own genre of film. In truth, it's a scratchy film, admittedly one with moments of class and social hilarity, nifty set-ups and ever likable young actors, but it's a bit too wrought to fully work, the odd blend of comic book values and crime busting youths is never at one for a fully rounded spectacle. But the hints of greatness are there, an awareness of the times, the half bombed London backdrop, the send-ups of Hollywood conventions, and the irrepressible Alastair Sim a forerunner of many eccentrics to follow.